Copyright policy of DeviantArt.com, one of the largest social networks and an online art community for amateur and professional artists to showcase work. I attended a talk by a doctoral researcher at the HCI International 2015 Conference, who presented her work on the emerging topic of contract visualization - an approach that aims at making legal contracts clearer and more user-friendly with the help of better typography, layout design and information visualization. What changes to legal information design might convey complex information in a more logical and intuitive manner? 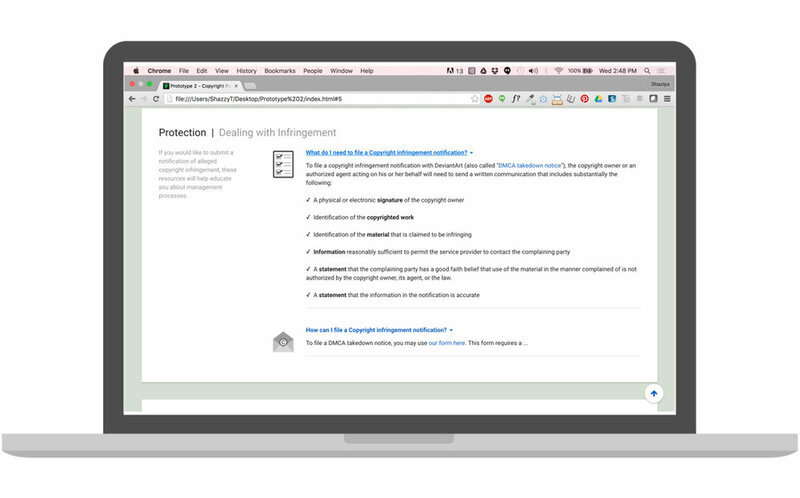 Can a standardized layout help demystify the legal wall of text into a clear, simple design that uses visual cues to support comprehension? This was my capstone Project as a Masters candidate in the HCI program at Georgia Tech. I have used these categories as a framework to organize the copyright content. Private Parts is an open-sourced, customizable toolkit by the mobile security company Lookout to help developers implement visual, user-friendly privacy policies. This plug-and-play toolkit was the inspiration behind my responsive visualization framework for copyright policies. Drawing from nutrition, warning, and energy labeling, as well as from the effort towards creating a standardized banking privacy notification, the process for constructing and refining a label tuned to privacy is presented (P. Kelley, J. Bresee, L. Cranor, and R. Reeder, 2009). Their user study methodology was particularly useful to me in understanding how a standard copyright policy compares with a restructured policy which employs visual solutions. In order to understand written texts people form mental models (Johnson-Laird, 1983), mental representations based on the principles of causality, spatiality and temporality (Zwaan, 1995). In light of CLT, both information structure (how the content is ordered and organised) and information display (how it is visually presented) should play a key role in supporting comprehension and intellectual performance. Compared DeviantArt’s standard copyright policy with my restructured policy by employing the Rapid Iterative Testing and Evaluation (RITE) method. Using a within-subjects design where each participant completes 23 questions relating to information-finding tasks, perception of comprehension and usability for each prototype while following a think aloud protocol. Quantitative assessments using binary Yes/No responses, along with a deeper assessment of the ternary ‘I Don’t Know’ response. The deeper assessment is tied to the ‘Phase I’ of qualitative assessments and hasn’t yet been explored for the purposes of this project. Content curation on collaboration with legal experts. Introduce a social aspect with inline commentary and discussion boards. Extend the functionality to other consumer industries like online marketplaces.